Has some kind of connectivity. Adrian Utley from Portishead notes “You can get all kinds of crazy and musical interactions going on with other analog gear and drum machines.” This appears to be a description of the matrix/patch bay described below. And it may have some new sound possibilities relative to the original. If you hate spoilers, um, sorry. One of my favorite sites, the German-language sequencer.de, gets hold of an image. It appears this is also a one-oscillator synth, with an uncommonly complex oscillator section. And Synthtopia reports on rumors that the price will be US$300 – which could make this a stellar success, a kind of analog answer to the microKORG, which was one of the most popular synths ever. Ironically, the surging popularity of analog synths leaves the field wide open for new instruments with digital oscillators, and a reminder that they’re capable of other sounds. But that’s why things often go in cycles. 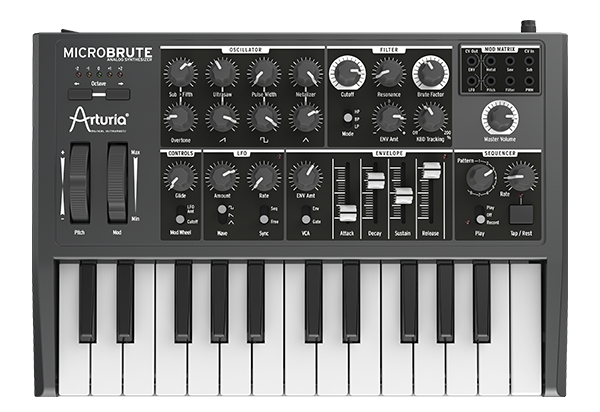 We’ll see (and hear) what this ‘brute is like soon enough.